snow! can you believe this is in iran? I actually arrived in Tehran the night before. I boarded my last intercity bus, taking on a journey of less than 3 hours from Kashan. I had heard a lot of horror stories about Tehran which made me decide to go there as late as possible (how wrong that decision turned out to be). Heavily polluted, reckless driving, no regard for traffic rules whatsoever and high chance of getting into road accidents – this was the Tehran that fellow travelers warned me about. After seeing a dead body from a road accident near Shiraz, I was inclined to believe the warning. But nevertheless, I was flying home from this principal city so I had to be there no matter what. The bus dropped us off the Southern Bus Terminal which was a beehive of activity. From there, one could find buses that go all around the country. As soon as I alighted, I heard touts shouting “Shiraz!” or “Yazd!” or “Esfahan!” Ha! I just came from those places, was the thought that came to my mind immediately. We were initially planning to take a cab from there our hotel but when the driver asked for 100,000 Rials (US$8), I just decided to take the subway, where there’s a station right underneath the bus terminal. The subway (they call it metro) is a fast, convenient and clean way to go around Tehran. I took it the first time that night from the bus terminal, and for IRR 3,000 per trip, we used it whenever we could. Our hotel was located near the Imam Khomeini station, in a street that to me resembled Banawe (a street in Manila which is filled with automotive shops). There, tucked away in a small alley is the unassuming Firouzeh Hotel. If there ever was a legendary backpackers’ place in Iran, I suppose this hotel would be it (Silk Road Hotel would be the runner-up). Though looking plain and not really value for money, most people come here for the hotel’s personable manager, Mr. Mousavi. We got our room for 400,000 Rials ($30). It was late when we arrived, so we stayed in the hotel and prepared for a quick run in the city the next morning. The following day was a Muslim holiday, the Eid. 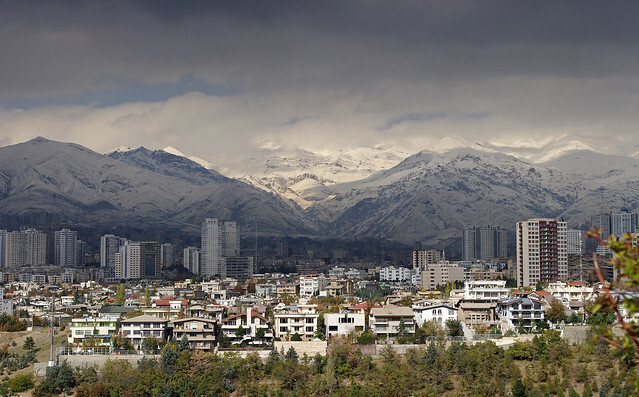 We were lucky to be in Tehran on this day as most people stayed at home, or went to the outskirts for excursions. There was not much traffic on the streets and the metro gave free rides up until about 11am. The air quality was also decent as it had just rained the previous day so the usual horror stories did not really apply to me this time (got away with it, ha!). We started the day by visiting the Azadi Tower which is the landmark of the city. Built only in the 1970’s, it is also known as the Freedom Tower. I call it the rocket ship. It was here that a group of policemen approached me while I was taking photos. They thought I was some spy and insisted on checking my camera to delete my photos. I reassured them that I was merely taking pictures of the tower but there seemed to have been a communication problem there. Later on they asked me where I came from, and when I said “Philippines” they eventually backed off. I guess it’s because my country is not known for diplomatic sabotage. After all, who has ever heard of a Filipino spy? The day was beginning to shape like tower day. 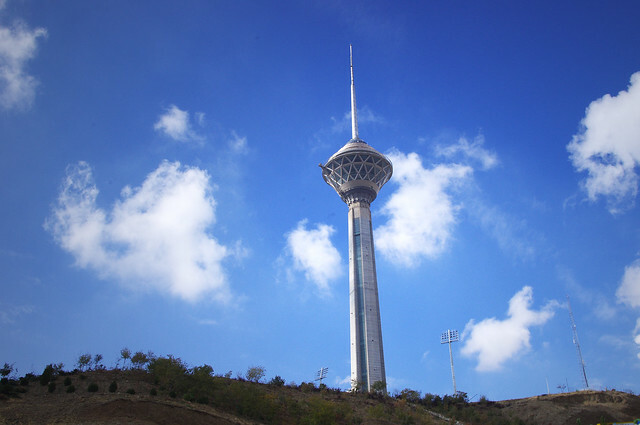 After Azadi, we went off to another — this time it’s Milad Tower. But before that, we made a short detour and alighted in Taleghani station. For the longest time, I had wanted to come here – a place that is very historical but dealt more with the recent past. I wanted to see with my own eyes the US Den of Espionage or the former US embassy in Tehran. For those old enough to remember, 1979 was the year of the Islamic Revolution which toppled the Shah of Iran and which shockingly turned Iran from a secular monarchy with very close ties with the United States into an Islamic Republic which labels the US as the “great satan.” I say shockingly due to the speed in which the tables were turned. Along with it came a prolonged hostage taking of US embassy staff that lasted for 444 days and resulted into the severing of US-Iran diplomatic ties. From then on, both countries have been enemies. 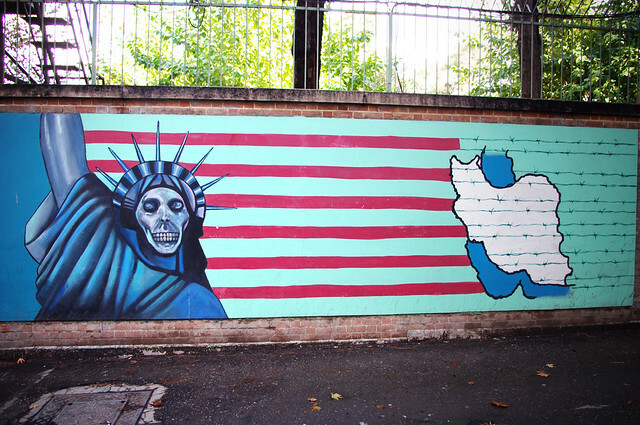 Today, the embassy grounds has been turned into some training center but memories from 1979 still haunt the place, such as the watch tower near the main gate, as well as several murals including one which depics the Statue of Liberty with a skull instead of a proper face. Note: I had recently learned about the storming of the United Kingdon’s embassy in Tehran. Is this another repeat of history? As shown by the 1979 incident, Iran’s reputation only worsened and it was the quickest way to turn the country into an international pariah. Looks like it’s heading in the same path with the UK embassy invasion. does this really look like the CN tower of Toronto? After this quick stop, we were off to Milad. There was no direct subway link so the cheapest way to get there was to take the metro up until Mosalla station and from there take a taxi to the tower. Many of those who have been there remark about its resemblance to the CN Tower of Toronto. But I can’t tell really. At 170,000 Rials ($13), it carried the most expensive admission fee of any attraction I had been to in Iran. But I really really wanted a bird’s eye view… and a visit to Iran doesn’t come that often so… The interior turned out to be a homage to modern, futuristic design. After 8 continuous days of going to ancient ruins, mosques and palaces from the middle ages and staying in hotels that are at least a century old, Milad was a welcoming change and again showed a different side to this country that continued to surprise me. I was led to the open-air viewing deck which had a marvelous view of the city. I knew Tehran was a huge city, but never had a chance to visualize until I saw it from about 260 meters above ground. I could see the mountains in the distance, the domestic airport and parts of the city’s more prosperous districts. Tehran was a lot denser than I thought. After the tower-filled morning, I decided to go up north. 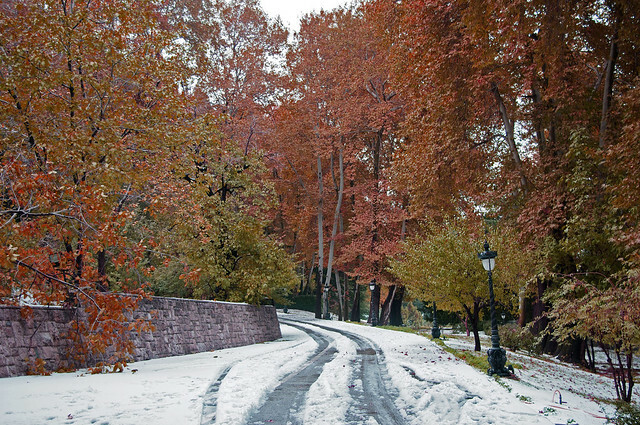 My initial plan was to go to the ski resorts in Tochal or have a great city view over Darband. But I eventually settled for Tajrish. Tajrish is supposed to be the northernmost metro station, but for some reason it’s not yet complete and we had to alight at Gheytariyeh (the station before Tajrish). From there, it was a short bus ride to Tajrish. By the time we arrived there, I could see snow from the ground. The district was a lively, happening place surrounded by shops, fashionable cafes, pizza places and diner-style restaurants. The people here were noticeably richer, as evidenced by the bandages around many ladies’ noses which announce to the world that they’d just had a nose job. Good vibes. I would go there again the next time I visit Tehran. It’s a city of great contrast, and for that day, I only got to see the good side of it. 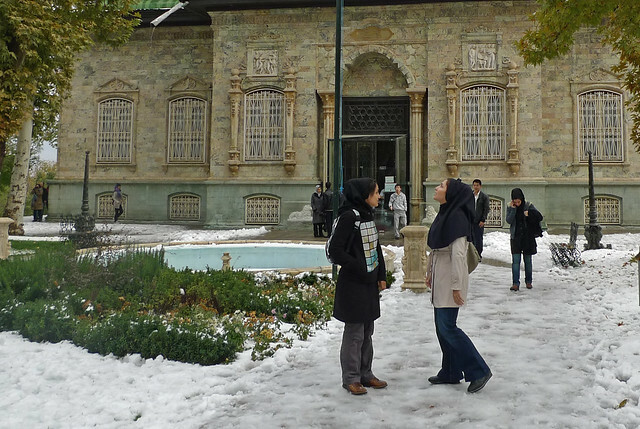 I wished to stay a little bit longer in Tajrish but the nearby Saadabad Palace beckoned our attention. It was a slippery climb uphill as the snow filled the city streets. We had also lost our way and had mistakenly entered another compound. 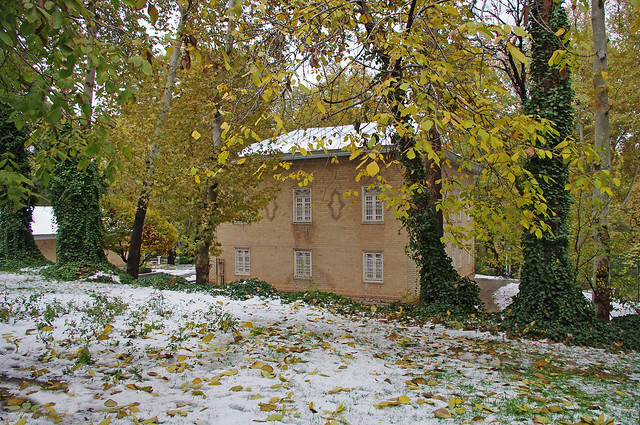 I was only to learn later, after speaking to the soldier guarding the place that it was actually the Presidential Palace grounds which is the current home of President Ahmadinejad. Saadabad is right next to it. Moving closer to the site, we noticed this was where the scenery dramatically changed to something not Middle Eastern. Known as the summer residence of the former Persian royal family, this magnificent former royal residence is set among several hectares of parkland. It was amazing to see in autumn and reminded me a bit of places like New Zealand or Canada. As it was a holiday, we saw many city folk with their families strolling around the palaces. To me, Tehran manifested the duality of this complicated country. On one end, it is an Islamic Republic following strict Sharia Law and where women were required to wear headscarves. 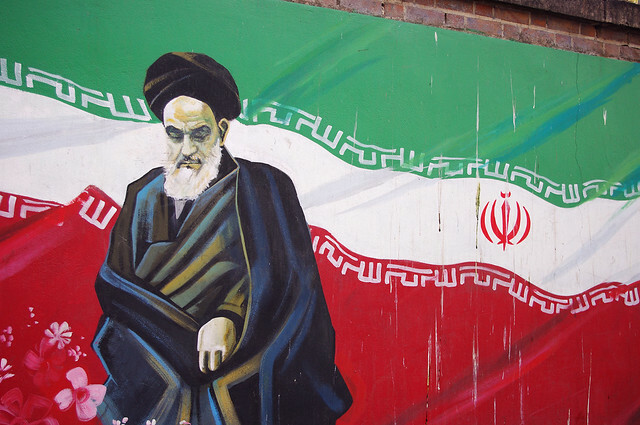 But on the other hand, the people in Tehran seemed overwhelmingly modern and forward-looking. It made me wonder all the more exactly how this country could turn itself into an highly-conservative theocratic state just like that. But then again, I suppose that’s not something which a tourist should be thinking about. Tehran Grand Bazaar – anything and everything. period. Crown Jewels Museum – once upon a time, there was a kingdom called persia and it was ruled by a king. this is where you see his crown jewels. I lived in Toronto for 10 years… I can say with full confidence – the tower does not look like CN tower! which part? Iran is just a short hop away! Ayan – out of curiosity, did you go? Yeah I have watched it. There’s a Singaporean adaptation ?!? wow!! not this could be on my list!